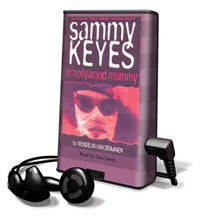 The sixth Sammy Keyes book is one of the most exciting yet, as Sammy and her friend Marissa decide to blow town and take a bus to the seedy, insane town of Hollywood to surprise (and shake some sense into) Sammy's mother, the elusive Lady Lana. When they arrive, they discover that she's transformed herself into the glamorous, platinum-blonde, "25-year-old" actress Dominique Windsor, who certainly could never have spawned a 12-year-old --let alone a scruffy, no-nonsense girl like Sammy. The plot thickens, however, as Lady Lana's masquerade backfires in the most dreadful of ways and Sammy is left to save the day and solve the biggest mystery of her life.